← Peer-review – I am beatin’ that horse until it dies! Welcome, briefly captive audience before the next click that takes you far, far away to a server in Bangalore or Vladivostok. News of the Week – Science 28 January 2011: Vol. 331 no. 6016 pp. 382-383 DOI: 10.1126/science.331.6016.382-a – what interested me here, was the announcement that Roche made, that a pharmacological inhibitor, RG7204 by the biotech company Plexxikon, extends life of patients with aggressive melanoma. Presumably only the ones with activating mutations in BRAF, which is an intracellular signaling effector in a number of growth factor pathways. I study among other things, the large congenital melanocytic nevus, a precursor condition in some cases to pediatric melanoma, which can be nasty stuff indeed and doesn’t respond well to current chemotherapies. If certain cases can rapidly be diagnosed as having constitutively active BRAF then they would also be good candidates for responding to this drug. I don’t know if this phase III trial includes children, but I highly doubt it. In the closely watched phase III trial, patients with the B-RAF mutation who received the drug lived significantly longer and their tumors grew more slowly compared with patients who received a standard chemotherapy drug, Roche officials announced in a press release. But the company did not disclose how much longer patients lived on average. Full results will be reported later this year at a meeting. Patients receiving the standard drug will now be offered the option of switching to RG7204. The FGF-BMP Signaling Axis Regulates Outflow Tract Valve Primordium Formation by Promoting Cushion Neural Crest Cell Differentiation by Jue Zhang, Julia Y.F. Chang, Yanqing Huang, Xiang Lin, Yongde Luo, Robert J. Schwartz, James F. Martin, Fen Wang. Circ Res. 2010;107(10):1209-19. FGF10 controls the patterning of the tracheal cartilage rings via Shh by Frédéric G. Sala, Pierre-Marie Del Moral, Caterina Tiozzo, Denise Al Alam, David Warburton, Tracy Grikscheit, Jacqueline M. Veltmaat and Saverio Bellusci. Development (2010) 138, 273-282. doi: 10.1242/dev.05168. The Wnt/beta-catenin pathway regulates cardiac valve formation by Hurlstone AF, Haramis AP, Wienholds E, Begthel H, Korving J, Van Eeden F, Cuppen E, Zivkovic D, Plasterk RH, Clevers H. Nature. 2003;425 (633-7). Massive Genomic Rearrangement Acquired in a Single Catastrophic Event during Cancer Development by Stephens PJ, Greenman CD, Fu B, Yang F, Bignell GR, Mudie LJ, Pleasance ED, Lau KW, Beare D, Stebbings LA, McLaren S, Lin ML, McBride DJ, Varela I, Nik-Zainal S, Leroy C, Jia M, Menzies A, Butler AP, Teague JW, Quail MA, Burton J, Swerdlow H, Carter NP, Morsberger LA, Iacobuzio-Donahue C, Follows GA, Green AR, Flanagan AM, Stratton MR, Futreal PA, Campbell PJ. Cell. 2011;144(1):27-40. PMID: 21215367. Stringent requirement of a proper level of canonical WNT signalling activity for head formation in mouse embryo by Nicolas Fossat, Vanessa Jones, Poh-Lynn Khoo, Debora Bogani, Andrea Hardy, Kirsten Steiner, Mahua Mukhopadhyay, Heiner Westphal, Patrick M. Nolan, Ruth Arkell and Patrick P. L. Tam. Development (2011) 138, 667-676 doi:10.1242/dev.052803. Ripply3, a Tbx1 repressor, is required for development of the pharyngeal apparatus and its derivatives in mice by Tadashi Okubo, Akinori Kawamura, Jun Takahashi, Hisato Yagi, Masae Morishima, Rumiko Matsuoka and Shinji Takada. Development (2011) 138, 339-348. doi: 10.1242/dev.054056. Vax2 regulates retinoic acid distribution and cone opsin expression in the vertebrate eye by Giovanna Alfano, Ivan Conte, Tiziana Caramico, Raffaella Avellino, Benedetta Arnò, Maria Teresa Pizzo, Naoyuki Tanimoto, Susanne C. Beck, Gesine Huber, Pascal Dollé, Mathias W. Seeliger and Sandro Banfi. Development 138, 261-271. doi: 10.1242/dev.051037. Dishevelled-associated activator of morphogenesis 1 (Daam1) is required for heart morphogenesis by Deqiang Li, Mark A. Hallett, Wuqiang Zhu, Michael Rubart, Ying Liu, Zhenyun Yang, Hanying Chen, Laura S. Haneline, Rebecca J. Chan, Robert J. Schwartz, Loren J. Field, Simon J. Atkinson and Weinian Shou. Development (2011) 138, 303-315. doi: 10.1242/dev.055566. And because if there aren’t any photos, it didn’t happen, here is the obligatory furry-animal shot to sweeten the medicine. 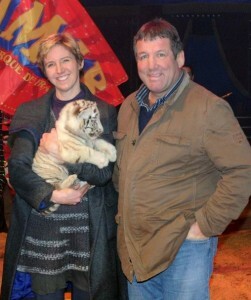 There was a deputy mayor of Bayonne (France, not New Jersey) on my right, and Pascal Ondarts on my left, a famous retired rugbyman, who baptized the tiger in my arms “Junot” at the behest of the circus Amar. They sponsor a patient group that itself supports my research in part. There have been other militant patient groups who have funded my work in the past and present, and I am grateful to all of them, and try to give them cause to be grateful to me in return. * And yet I am not supposed to, nor do I, spend all day on the computer. I am no longer even a blogger. I am back to being a developmental biologist and an amateur musician and a few other roles, and that is starting to feel good and natural again, even though I get twinges when I see the fuss around science blogging conferences. If only we could live many lives in parallel. It’s all I can do to keep a couple going. That French-American biomed researcher again. The tiger kitten is ADORABLE! It’s so cute when animals haven’t yet grown into their paws/head. Did it feel as soft as it looks? Was it heavy? Heather you look adorable ! Thank you, Alejandro. Soft and heavy, too, in my own way. See the stars in my eyes? Yep, it’s as soft as it looks, and about as heavy as a fat cat the same size. And I didn’t even sneeze (I was terribly sensitized from the horses earlier). Nice one Heather! I like the “open tabs” idea. Oh, and welcome to the OT guest blogger list. Thanks, Frank, for the comment and the welcome! Nothing to like about my multi-tab lifestyle, really, it’s my constant way of being on the Internet. My desk is much the same. Definitely horizontally organized. Hey look – there’s a tiger cub! Welcome to the OTR from over here too. And that is a truly impressive set of browser tabs – did you actually read all those papers? If so, I am in awe. Richard – I think the point is that by leaving the tab open you don’t actually have to read it. That’s how it works for me anyway. Do you have ANY IDEA how jealous I am that you got to hold a tiger cub? IMHO the only thing cuter than a tiger cub is a tiger cub with a baby orangutan sidekick. I would pay SO MUCH MONEY to take your place in that photo! I, too, open tabs to save articles for later. It does become a problem after a while… I try to clear them on lunch breaks, but I typically still have 3 or 4 open at the end of the week. You did give me a wee idea at the moment 🙂 But that photo is very effectively cute. Amazing how our minds want to anthropomorphize so badly. I can’t help it, even when I’m aware of it. Maybe it’s a common trait among animal lovers. We’ll ask Kristi sometime. I’m sure there’ll always be a place here for you to get things off your chest if you feel you need to. Thanks for the warm welcome into the fold, everyone. Time for the next Irregular to step up to the bat. @R – what Frank said. I’ve perused some of them enough to be able to close the tab after downloading the PDF, but right now four of the articles are still open, along with a bunch of other new stuff. Including the upload page for a grant mechanism, that as Steffi knows had no input from two of my three other partners until – get this – yesterday afternoon. Part of my writing this post was because I had given up on them. Submission: Monday, January 30th. We could have a group tab dump on Fridays, what say? Sometimes it’s fun to see what people have open on their desks. Purely voluntary. I like the group tab dump idea! I’ll add my welcome too, Heather (though I still feel too new at OT to be doing so). Interesting news about the BRAF inhibitor; I hope it lives up to the initial promise. Lots of excellent papers, too – can’t look at them all, but I’ll definitely add the work on tracheal rings to my lecture on lung development in March. I ended up getting more tabs open since I am too curious not to click on some of (ok, almost all) the tabs you mention….. I too open tabs and then either down load the pdf “for further reading” or bookmark in my “maybe interesting later”folder that I keep. I clean that one out about once a month, since usually they are time-limited-interesting. And that photo is so cute!! Nice list, but I am standing strong and refuse to check out that article on combinatorial TFs, something related to part of my Ph.D. thesis work (some stuff I did on dimeric interfaces for some TFs). I’d want to know if they tested monomeric TFs, or the functional unit (in a lot of cases, dimers). Good to see you blogging here. I just read a review of Instapaper and am wondering if this might help me to reduce my tendency to have too many tabs open of things I mean to read? It seems particularly useful in combination with an iPhone or iPad. Perhaps the real problem is lack of time to read things that are interesting but not essential? I agree about the main problem – and usually, the world continues spinning when we’ve missed reading certain things. It sounds really good when you have a commute using public transportation, and an intermittent connection. And, as you say, an iPhone. Maybe this is one to flag up to Henry. Yes, I was wondering who would pick up on it, and whether or not I should write a blurb about it, too (but I didn’t have the time). Don’t we all want to be taken care of!